This was a big weekend for Team Stimey. Saturday was not just Jack's birthday, but also the Cheetah-thon. Sam had a soccer game. My mother-in-law was in town visiting. 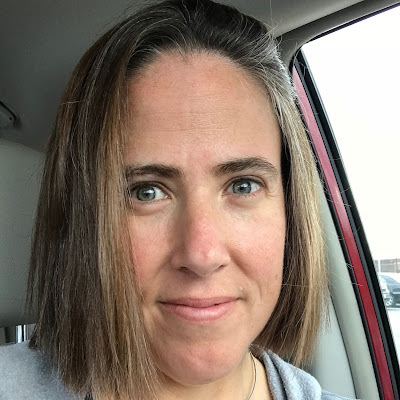 Sunday, of course, was mother's day, so I was busy sleeping in and going to the park with my kids and having friends over for dinner. I have lots of thoughts about these things and even more photos. The only problem is that I am too exhausted to do any of these topics justice right now. So what Imma do is give you this photo of Jack on his 9th birthday. 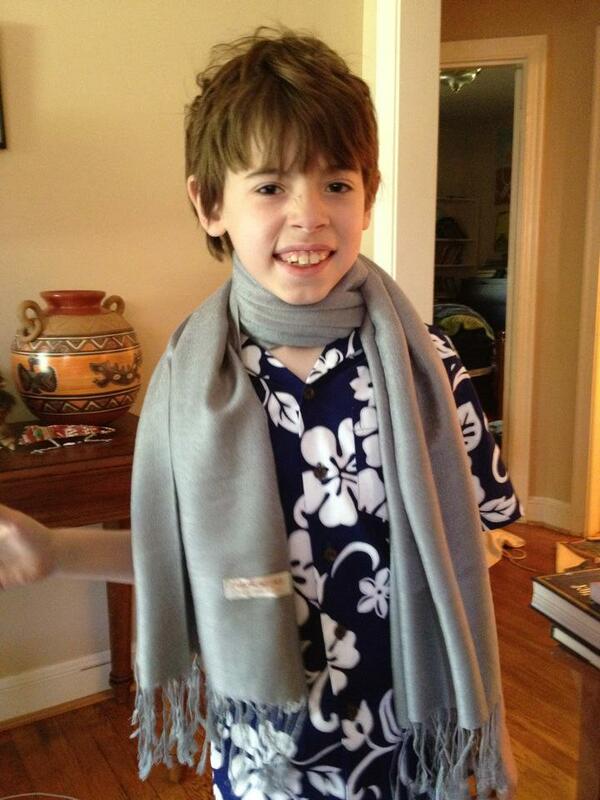 Yeah, it's a little weird to get your 9-year-old son a pashmina for his birthday, but it's a sensory thing for him. 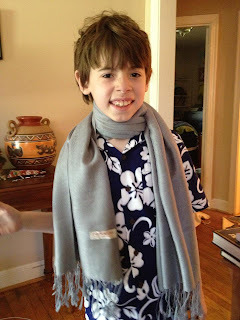 One of his teachers lets him borrow her scarf at school, but he needs his own now that he'll be going to another school. Also, last week he asked for "a shirt with flowers on it that will make me look like a Hawaiian." I'm also going to give you this photo of Jack and his coach at the Cheetah-thon. This photo gives me the warm fuzzies. Jack was so happy during that skating session. He was grinning and laughing and skating with his coach and skating with his best friend and just so...happy. This is why I write so much about the Cheetahs. This is why special hockey means so much. This is also why I want you to pay attention to the next paragraph. The Cheetah-thon was a rousing success. Do you want to know one of the reasons why the Cheetah-thon was a rousing success? YOU. YOU helped do this. YOU donated $10 or $50 or $200 or you tweeted about the Cheetah-thon, blogged about it, shared a post about it on Facebook, or commented on one of my posts about the Cheetahs. You let the Cheetah Nation know how much you care about them. Trust me, they noticed. At the Cheetah-thon, the coach stood in front of the attendees and told the players, "If you've ever wondered if you were special, just look around you. All of these people are here for you." YOU were there for the Cheetahs. Thank you. Speaking of which, thank you to Jessica and Stephanie and their families for being the most recent Cheetah donors for Jack. Also, a huge thank you to Sandie and her family (and everyone else who showed up) for coming to the event. A very special thanks to Justine for helping too. You know why. I promise to tell you more about the Cheetah-thon. Mostly because I can't damn shut up about it. Before I go to bed and put a close on this weekend, however, here is one last photo of my birthday boy. That cake is kind of the perfect metaphor for Team Stimey: sort of weird looking, a little quirky, but delicious and full of love. i love how it looks like he is going to lick the cake! Happy Birthday to Jack and how lucky is he to a) Have a family that understand his sensory needs (our 2nd son loved the feel of silk ties for years) and b) Get to go skating with the Cheetahs. Go Cheetahs! Go Jack! Go... umm... Hawaiians! It is great that Jack had such a great birthday! Love his scarf & shirt!! Since Delora and Jodi have bdays about the same time as me, I've decided we should have a drink together next year. Looks like Jack gets to come, too! Congrats on the fundraising success! Happy Birthday, Jack! He DOES look like a rock star in the Hawaiian shirt and pashmina. So glad the Cheetah-thon was a rousing success. So.... if Jack's birthday falls on Mother's Day, who gets precedence -- mom or the birthday boy? And speaking of odd birthday requests, K has been asking for the Japanese versions of DDR games. Fortunately, my geeky husband found some online. But because he can't actually make a decision, he's been waiting for me to choose one. It may not get here in time for K's birthday so we will have a small back up present for him on his birthday. And K did not want a party this year. Instead, we are going to take a day off from school and go to our local amusements park's opening day. It's his 10th birthday and I felt we should do something kind of special. And here I thought Quinn would taste like cotton candy. Happy Birthday to Jack and Mother's day to you! Nope. Mint. You're thinking of his hair. His HAIR tastes like cotton candy. Can I at least drive him and sit outside? You can be our designated driver.